The battle for water control becomes even more intense, a new protagonist looks out from the top of the mountain. 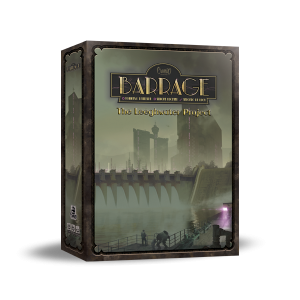 “Barrage the L.P.” introduces a new faction to the basic game; play Ellen Vos, from the Netherlands, ready to follow in the footsteps of Jan Leeghwater. Use the external Works mechanics, a set of powerful tiles that can be obtained from a new action space, and the personal building mechanic that will offer a combination of five building tiles, each one with a different powerful effect. Take advantage of Two new executive officers and Three new advanced technology tiles dedicated to the construction of personal buildings. More energy in your hands!